Regular readers know that AVweb's John Deakin is active in the warbird community ... a master at flying big radial-engine transports like the Lockheed Constellation and C-46 Commando. 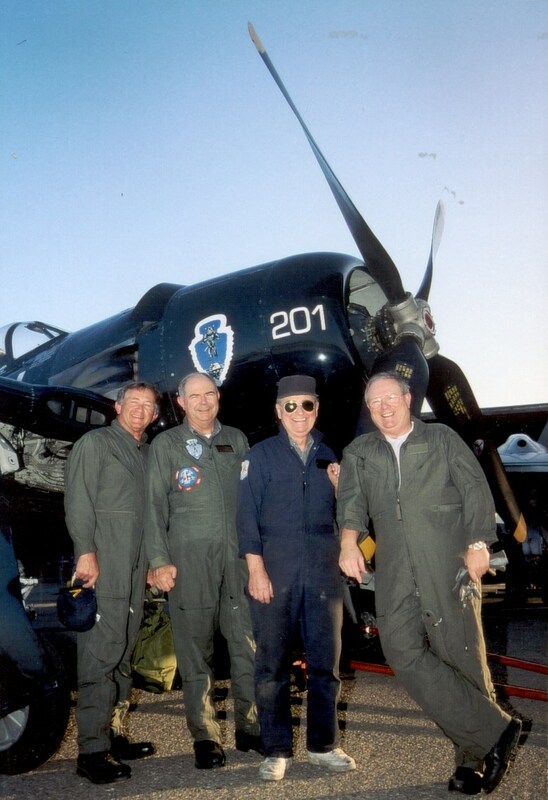 Recently, however, John had the opportunity to fly a very different breed of warbird: the Grumman F8F Bearcat. Deak explains that when you take an 8,000-pound airframe and add a 2,200-hp radial engine, what you get is an elevated pulse rate. Talk about a muscle machine! It looks the part, and it flies like it looks. I really hate to brag (you do believe that, right? ), but I'm having so much fun with this beast, I just have to tell you about it. The Grumman (aka "Grumman Iron Works") F8F Bearcat was first delivered in 1944, and was built to meet the Navy's desire for aircraft carrier protection. The idea was to launch, get up high quickly, and pounce upon the enemy at short range. It's essentially the superb Pratt & Whitney R-2800 engine, with just enough "stuff" hooked to it to make it fly. This 2200 HP version of the engine weighs about 3,000 pounds, and the whole airplane without armament, empty, is about 7,000 pounds. Max gross is 10,400, but since the only "load" we can carry is fuel and one pilot, we never see more than 8,000 pounds, max. Only about 1,200 Bearcats were built, and only about half a dozen of them remain in flying condition today. Unfortunately, they came along too late for WW II, and by the time the Korean hostilities broke out, jets made the F8F obsolete. Bearcat prices today start at about two million dollars, if you can find one for sale at all. They don't change hands often. By modern standards, where the kerosene burning screechers have a better than 1:1 thrust-to-weight ratio and can accelerate in the vertical, the Bearcat may seem a little tame by comparison. But a modified Bearcat still holds the piston-powered world record for its class for time to climb. That record is 96 seconds, from brake release at sea level to 10,000'. The Bear that I have the honor of flying is fairly "stock," but it's still a pretty impressive airplane when you lay the whip to it. Deakin with Bearcat in 1961. I've been active in the Southern California Wing of the Confederate Air Force for some time, but never dreamed I'd be invited or allowed to the fly the Bear, which is owned by the CAF, and assigned to the "SoCal" Wing. By CAF rules, only five pilots are assigned at any one time. When a vacancy occurred, and I was invited to join that group, I asked only, "Whom do I have to kill?" N7825C is an F8F-2 airplane with an engine from an F8F-1, the R-2800-34W engine. The airplane and the engine are in superb condition. It is flown often, attending airshows almost every weekend during the season, and even staying busy in the off-season with photo shoots, flybys, etc. Any of us can go fly it anytime for proficiency, just paying for the gas and oil (at about $150 per hour). One member of the group, Mike O'Hearn, does a very nice aerobatic show routine in it, and that's very popular at shows, too. 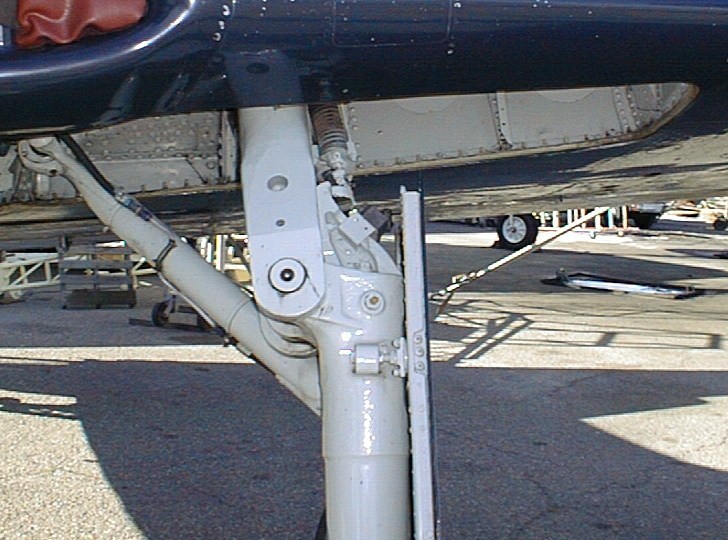 Stock Bearcats have the fairly unusual AeroProducts hydraulic prop, with its own reservoir of hydraulic fluid in a small drum that is attached to the rear of the prop hub, rotating with the prop. All the prop control mechanism (governor) is in that assembly, also turning with the prop. Parts for it are getting very scarce, and we may be forced to someday convert to something else. Early Bearcats had four .50-caliber machine guns (half-inch diameter bullets), two in each wing, and the later models replaced those with the 20 mm cannons. (20 mm is about 0.79 inches, a much larger projectile!) No missiles, no radar, just a nasty, mean little street fighter with an attitude and awesome performance. All the armament and most of the protective armor has been removed from 25C, of course, leaving large bays in the wing for spare oil, cleaning supplies, and luggage. With a capacity of only 169.7 gallons, it is a very short-range bird, indeed. 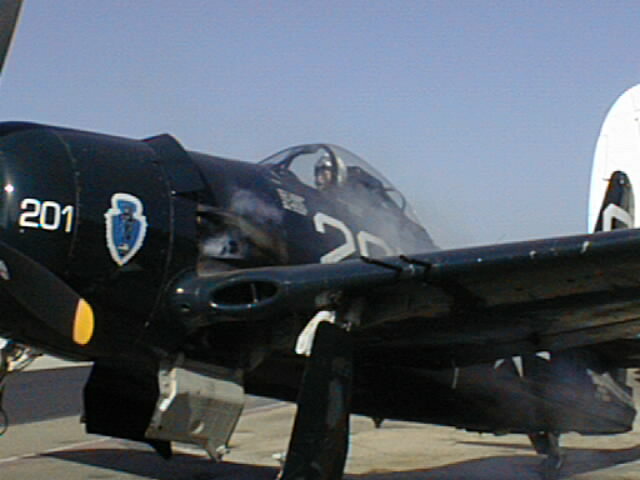 (Standard fuel on the F8F was not much better at 185 gallons, and 25C is even shorter legged.) If all possible fuel-saving measures are taken (250 knots IAS at very low power), you had better be on final approach with landing assured within two hours! All the fuel is in one big tank in the fuselage, right behind the pilot. None at all in the wings, there simply isn't room. It is possible to mount a 150-gallon drop tank on the fuselage centerline, and 100-gallon tanks on the hardpoint on each wing. We actually have one of the centerline tanks that we could use, but the FAA takes a dim view of mounting anything on any civilian airplane that can be dropped. If we do ever use it, it must be installed so that it cannot be dropped. Most of us are just a little bit squeamish about having 150 gallons of fuel hangin' down there, hard-mounted. Why? Well, think about an engine failure on takeoff, right after gear retraction. The immediate belly landing would destroy that tank, fuel would go all over the place, and there would be plenty of sparks to ignite it. No thanks, I'll take the extra fuel stops. Besides, I fit the cockpit like the cork in a wine bottle, the parachute is fairly hard, and about two hours is my max limit in the little fighter, anyway. Funny, I don't remember that cockpit being so small when I was 21, and 165 pounds! The airplane is a little short on oil, too, holding only 18 gallons. Most R-2800 engines in other airplanes have 30 to 50-gallon tanks, but once again, weight ruled the design. That's not as bad as it sounds, the ratio of oil to fuel is within the normal range. In the Bear, 15 gallons are required for takeoff, with an ominous warning in the manual about carrier launches with less than 13 gallons unporting the oil pickup. We service the airplane after all flights, no matter how short. You never know when there will be some problem that might take some time to sort out, and I'd feel very foolish being "up here, wishing I was down there," short on fuel after foregoing a fill up from the previous flight. Look, Ma ... Folding Wings! The wings are short and stubby, with just enough room for the guns, the landing gear, flaps, and some control cables. The outermost six feet fold manually, reducing the wingspan from 35.5 feet to 23 feet for ease of maneuvering on a carrier. At one time, Grumman experimented with a rather novel concept. The tips were intentionally weakened at the folding point so as to fail under high loads, acting as a protective device, leaving much shorter, stronger wings. But in solving a non-existent problem, Grumman created another. 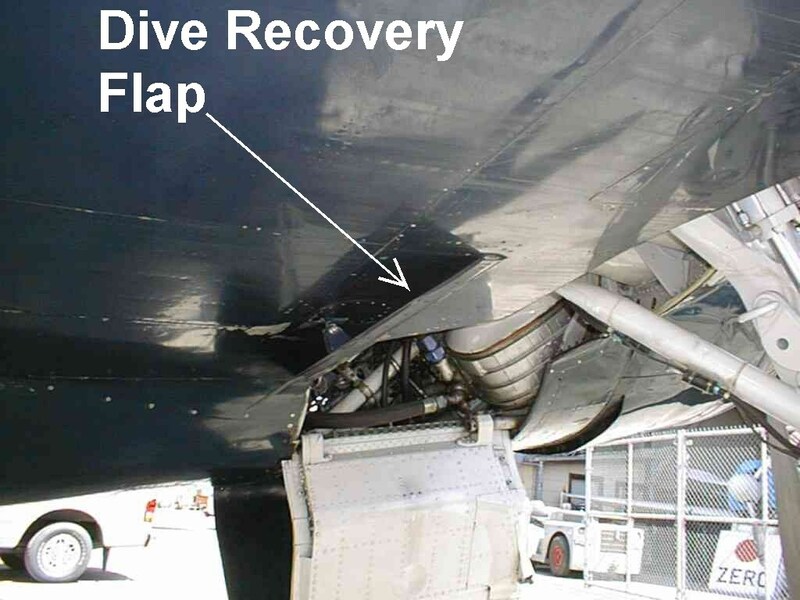 They found through experience that just one tip might come off under load, leaving the other intact, thereby rendering the airplane unflyable. (Guess how they found that out?) Piling one poor solution on top of another, they then experimented with explosive bolts, so that the pilot could, in theory, blow the remaining tip off. For some reason, this was not a popular feature with the test pilots, and the structure was returned to full strength, without the explosives. Good move, Grumman. 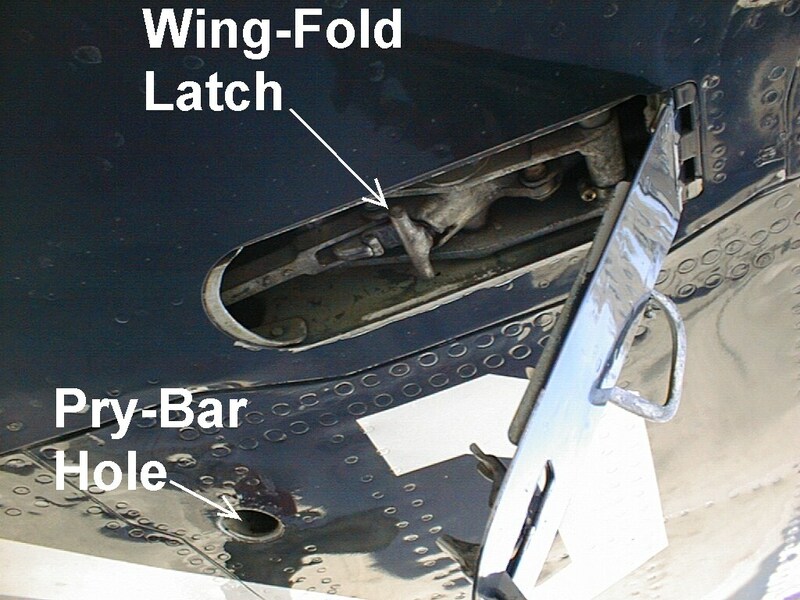 To fold the tips, a small hatch is opened underneath the wing at the joint, and a mechanical latch is manually unlocked. Then a round steel pry bar is inserted in a hole, and the tip is simply levered up by hand. The process is reversed to extend them again. Simple, and effective. It's also a very good item to check on the preflight walkaround! Mercifully, that little hatch cover cannot be closed unless the wing is fully locked. The gear and flaps are hydraulically actuated, and have some interesting features. The 15-foot prop is so big, and the airplane so short, the gear had to be made in size "extra-long." This presented an interesting design challenge, in that the gear must be mounted far enough out on the wing to allow the gear to swing inwards. The further out on the wing the gear is mounted, the more structure is required, and more structure means more weight. Grumman came up with an interesting design where the gear leg pivots about a foot down from the wing, with the top moving outwards, and the wheel swinging up and in. The gear has a very low speed limit of 140 knots, operating or extended, and the prop is so large that it would contact the runway when the airplane is somewhere around the level attitude. These two factors force a three-point (or at least a very tail-low) takeoff and immediate gear retraction, or the limit speed will be exceeded. All landings are three-point by policy, or very tail-low to provide more distance between the prop tips and the concrete. The flaps have a automatic blowback feature, so the lever can be placed in the full-down position at any speed without harm, as a normal operation. As the airplane slows, more and more flaps come out. Nice. A couple of minor systems are hydraulic. 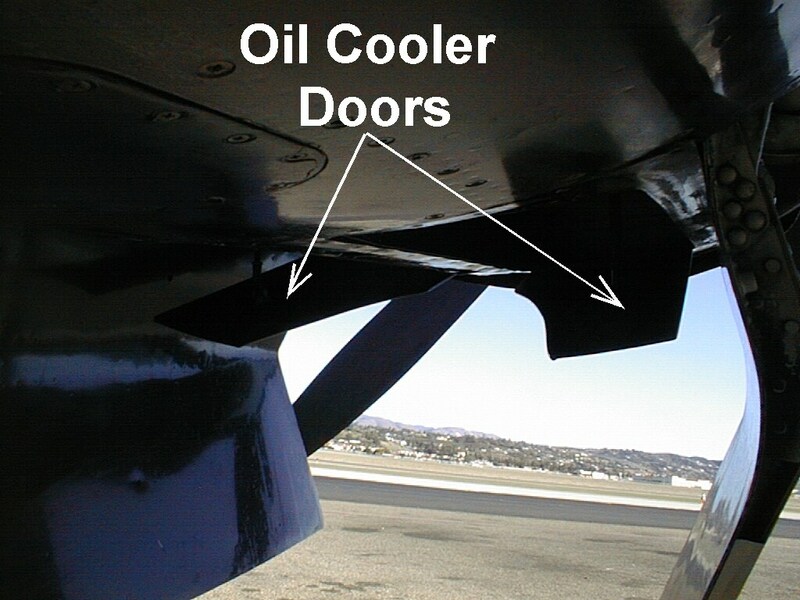 There are two oil shutter doors, open for oil cooling on the ground, usually closed in flight, with a speed limit of 240 knots. There are also "Dive Recovery Flaps," very small flaps on the belly. Apparently at very high speeds, the elevators get very stiff and heavy, and Mach effects prevent recovery from the dive. Extending these little flaps will give just enough pitch up, and add just enough control to break the dive. We don't go there, of course, remaining below 350 knots at all times. 300 is even better, as a limit. Brakes are also hydraulic, but they are the same type so common in cars and general aviation airplanes, just individual master cylinders driving phenolic pucks against a steel disk. Bearcat pilots must be very familiar with the procedure to bleed the brakes. Left to right: Deakin, Gary Barber, Ken Kramer (our crew chief, easily the most important man in the picture! ), Steve Barber -- Camarillo, Calif., 2001. No dual control, or even two-seat Bearcat was ever made, meaning the first flight is always solo. The contrast between the checkout "then" and the checkout "now" is quite amusing. 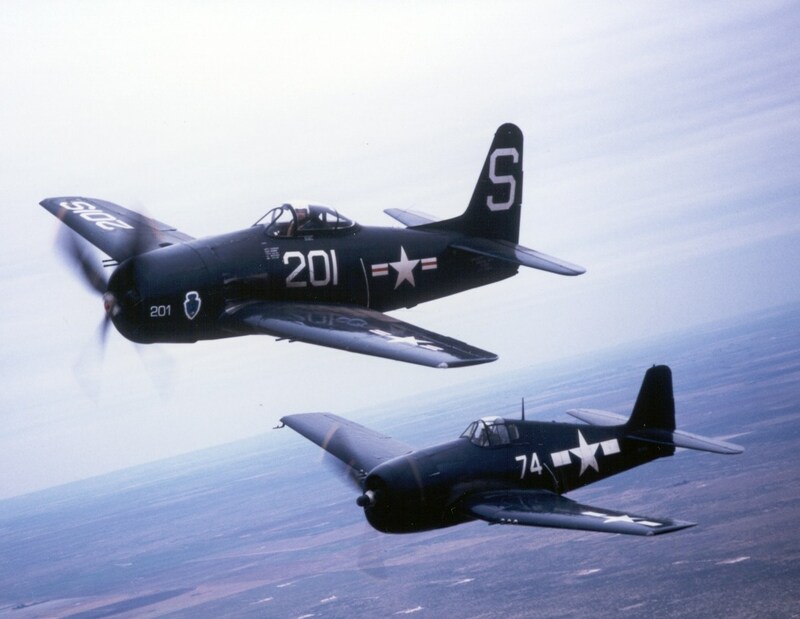 In years gone by, all military pilots started out in basic flight training in the North American AT-6 (the Navy called it the "SNJ") and many of those pilots had instructed in it from the back seat. All had flown more airplanes with tailwheels than those with those cute little training wheels on the front end, and all this was excellent preparation for the fighters of the day. Quite often, the "checkout" was "There's a Bearcat, go fly it." My own early experience was along those same lines, but in the civilian world. The Sarasota Bradenton airport was an interesting one, with many old warbirds, and it was also the home of Trans-Florida Aviation, manufacturer of the "Cavalier 2000." This was a highly modified P-51, converted for "executive" use, with two seats, leather interiors, autopilots, and high-end airline radio equipment. Trans-Florida also built a number of dual control Mustangs, some of which are still flying today. At one time or another, I had managed to get my hands on most of the oddball airplanes around that airport, so I wasn't entirely unprepared for a Bearcat flight. The owner gave me a 10-minute cockpit briefing, and away I went, blissfully unaware of some of the pitfalls and risks, and totally unaware of my incredible good fortune. It seemed perfectly normal, at the time. In 1961, the historical significance of the WW II aircraft had not become obvious. Boy, have things changed! The FAA decided long ago that there would be a LOT more formality involved, and a system of "LOAs" (Letters of Authority) was put in place, to cover all experimental aircraft with 800 HP or more and a Vne (never-exceed speed) of more than 250 knots. In the early days of this program, I think there was some language on "grandfather rights," for those who had been flying them, but now LOAs are required for everyone. The Confederate Air Force is also understandably concerned about who gets into these priceless old aircraft, and have even more stringent requirements. Once Headquarters approves a pilot in principle, a CAF-approved training program must be submitted to the FAA. The FAA then reviews the program, and issues a "Temporary Training LOA," authorizing specific flights, at a specific location, with very strict guidelines. Basically, this "program" required a series of training flights in the AT-6/SNJ, with me flying from the back seat. Since I was already a CAF-rated instructor in the airplane, this was no big deal. Then two check rides were required in the back seat of the T-6, each given by the holder of an "LOOA" (Letter of Operational Authority). This is very similar to the CFI, in that the LOOA "recommends" the issuance of the LOA, and the FAA then issues it, sometimes requiring a check ride. Check rides in single-seat aircraft are a bit problematic, so if the FAA judges one is needed, the check pilot can either sit by the runway and watch, or fly along in another airplane, directing the ride. If that sounds bizarre and confusing, try going through the process! Steve Barber is one of the five Bearcat pilots, holds the "Unlimited" LOA, also the LOOA for the Bearcat, and is also a check pilot in the T-6, so he signed off the first check ride after harassing me for a couple hours in the airplane. For the other, I took the T-6 down to Ramona CA, where the legendary Chuck Hall lives. Chuck is also an LOOA holder (unlimited LOOA, in fact), in addition to being a long-time Reno race pilot, test pilot, owner of a pristine Mustang, and owner of "Chuck Hall Aviation," the FBO there. Chuck is an old friend, and the check ride with him must have been ok, because he gave me the final green light to fly the Bear. All that was submitted to the FAA, and in due time, the "Training LOA" was issued. The conditions were to remain within 25 miles of Camarillo, acquire at least three hours of flight time, and at least three landings. That's when the real fun started! One must first board the aircraft properly, of course. The Navy does everything backwards, and this means that one clambers up the right side. It's a long stretch even for my long legs, with a kick-in footstep for the left foot, then the right foot can reach the wingwalk. The handhold is also a fold-in type, at pretty well at the highest point I can reach. I guess the Navy likes tall skinny guys, and I'm only half-qualified, there. Fueling is accomplished on the right side, too. A single filler is just forward and below the cockpit, and a bit tricky to use. Any attempt to fill it too quickly will result in a slow buildup of air pressure in the tank, and suddenly a couple of gallons of 100LL will blast back at the unfortunate pilot. Smoking is not recommended while refueling. Oil is checked on top of the engine, right side, but to check the hydraulic fluid, one must climb down, walk around the left side, and crawl back up again, for that hatch is just forward of the cockpit, high. Bearcat pilots get a lot of exercise, climbing up and down. For those who tend to forget things, it's even worse. "Oops, forgot my helmet. Ooops, forgot my charts," etc. While up on the wings, pilots must check that the gun bay covers on top of the wing are fastened properly. If one popped up, it would make a very effective spoiler, and I don't think I'd like the results. Walk around after that is pretty conventional, pulling off the external control locks, checking that the folding wingtips are locked in the extended position, checking brake wear, no leaks, no damage, etc. We usually pull the prop through a couple turns. Some feel this is necessary to detect a hydraulic lock, but I disagree with that concept, myself. It is a useful chore on this airplane though, because quite often a fair quantity of oil will puke out of the engine and drip on the ground. The EPA might not like that, but any oil thus eliminated is that much less oil that will spray all over the airplane during the start. Since junior Bearcat pilots are expected to wipe off the airplane after they fly it, a little effort pulling the prop through a few times is well spent. It is also just about all one person can handle, this isn't your average engine! The compression ratio may not be all that high (about 8:1), but you're always compressing three or more cylinders at any given time. The heart rate goes up a bit, as you finally mount. But that goes away when you realize you forgot to get the parachute. Back down off the wing, into the hangar, and back up on the airplane, all to the cheers and jeers of the onlookers. There are ALWAYS onlookers, most of whom don't miss a thing. "Hey John? You forget to open the oil coolers after that second landing..."
Strapping in is a lot of fun. Just picture that cork in the bottle, trying to put a parachute on, then buckle up two shoulder straps and two big old stiff military seat belts. With a little practice, it can be done smoothly, with a minimum of sweating and swearing. Then the helmet… Uh, helmet? HELMET? Oh man, it's locked in my car. Mercifully, I keep my Nomex gloves inside the helmet, or I might have forgotten them and had to repeat the process -- again. Maybe there's a reason for the age-60 rule? Most pilots of these aircraft wear full Nomex (green) jump suits and gloves (one of us has been called "The Great Green Pumpkin"), Kevlar helmets, and paratrooper boots for protection from fire, or from from windblast in the event of a bailout. These are military airplanes, not designed as well for safety as modern airplanes, and bad things can and do happen. It's best to be well-prepared. The downside is that Nomex isn't the coolest costume around, most airshows occur in the summer, and temperatures can easily go to 160 degrees in these cockpits. There is no insulation at all at the firewall, which is all that separates 2,200 heated horsepower and the pilot. The Bearcat pilot is very well advised to close the canopy before starting, for two big reasons. The smoke that belches out of all radials on startup is oil smoke, and will royally anoint everything behind the stacks, including the pilot in an open cockpit. The other reason is much more serious, a "stack fire." 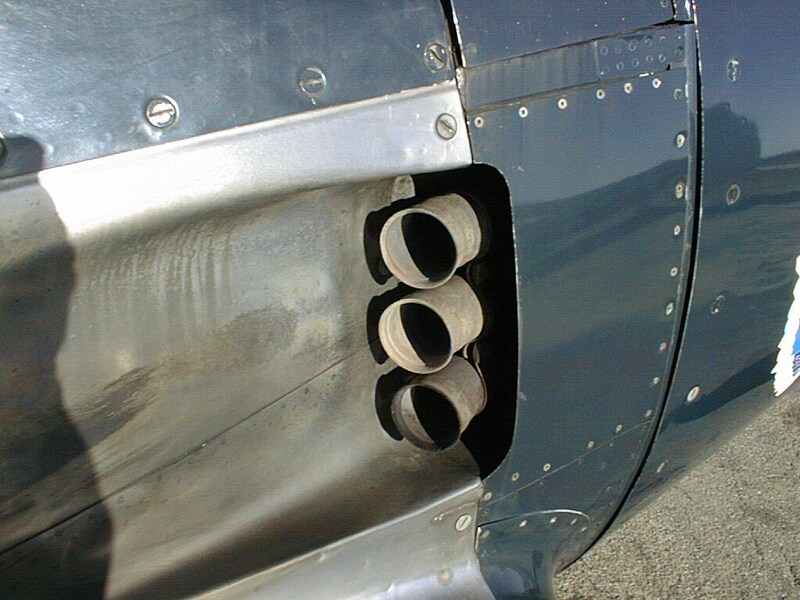 If the pilot primes a bit too vigorously, especially with a hot engine, raw fuel will find its way into the exhaust manifold, ignite, and cause a spectacular fire out the exhaust pipes. While not a good thing, it's reasonably harmless, provided the pilot keeps his head, keeps a'crankin', gets the engine started, and blows the fire out. The paint may get a little scorched when this happens, but if it gets out of hand, the airplane can be lost. If the canopy is closed, the fire will blow harmlessly past. If it's open, the best that will happen is singed eyebrows. Once the engine is running well, the canopy may be opened again, for ventilation. The start itself is by the conventional radial method, electric fuel boost pump on, prime only, mixture fully cut off ("Idle Cutoff"). 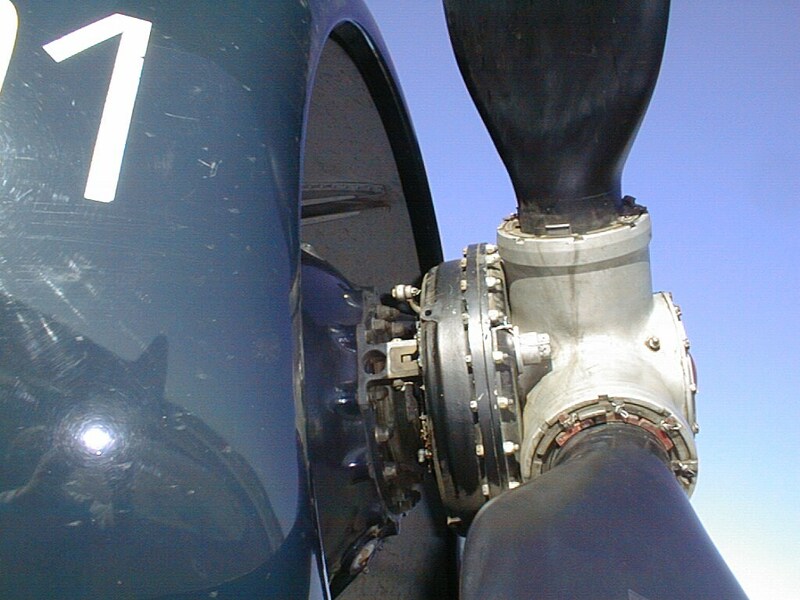 The prop turns very slowly on the starter, and will often halt momentarily when the spark lights off one or more jugs. But eventually everything comes together, and the engine snorts to life. Ahhh, that's a lovely sound, 18 big jugs all making noise! That sound is probably half the attraction, at airshows. As soon as the engine fires, the electric prime is held on continuously, still with the mixture in idle cutoff until the engine stabilizes at about 800 RPM, and the oil pressure is up to normal. Only then is the mixture advanced to "Auto Rich." The mixture coming from the carburetor, combined with the fuel from the primer, is much too rich, so the engine will promptly flood and start to die. That's the signal to the pilot to let go of the primer, and the engine should then run normally. Some engines will require another tweak or three on the prime. Once the engine is running, the boost is switched off to check the engine-driven pump, the flaps are cycled to check the hydraulic system, and the airplane is ready to taxi. The tailwheel is a tiny, solid wheel, and very hard, so the pilot feels every crack in the concrete, every bit of gravel, clear up his spine. Control with the rudder is good, only very light taps on the brakes are needed to maneuver on the taxiway. 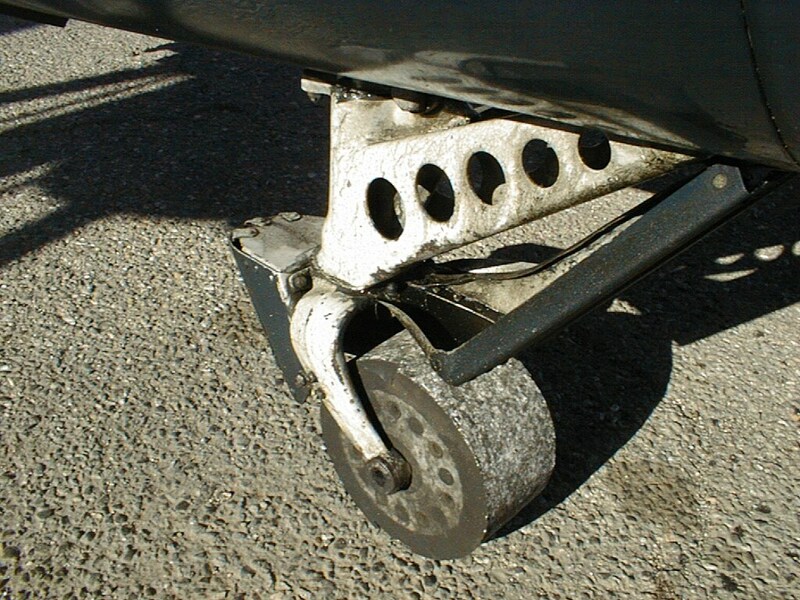 The tailwheel is either completely free-swiveling, or locked straight. Taxi visibility is very good for a tailwheel fighter, but the pilot cannot see straight ahead, making constant S turns a necessity. Runup is pretty standard for the big radials, a quick prop check at 1700 RPM, then the power is advanced to field barometric pressure (about 30 inches at sea level, about 25 inches at Denver, for example). This should produce 2200 RPM, as a power check. Mags are also checked at that power, much higher than the normal GA airplane. This power check is attention-getter for the new Bearcat pilot. It's equivalent to cruise power, and the thought is, "Geez, if this thing feels like this now, what's it gonna feel like on takeoff?" Only a tiny bit more power, and the brakes will not hold the airplane back, the tires will simply skid on dry pavement. Runup complete, the final checklist is run. Unlike many fighters, no trim is preset, or needed. Grumman learned many lessons from the earlier aircraft, and got a wonderful harmony of engine offset and surface deflection, so that very little yaw is evident on the takeoff roll. Not allowing the tail up helps, there is no gyroscopic effect. While taking the runway, the canopy is closed, the electric cowl flaps are closed down to a bit less than half, the transponder, boost pump, and strobes are turned on, and after the airplane is aligned with the runway, the tailwheel is locked, and it's time for the games to begin. Many will hold the brakes and push the power up to about 30 inches for a final quick engine check, then the brakes are released, and "more power" is added. Acceleration is "brisk," to say the least. While there is little yaw to the left, the massive torque does jam the left wing down very hard, and instinctively, I use full right aileron to counteract it. I wonder if we use more left tires than right? Very few pilots, new to the airplane, will even be able to get full power on before liftoff, because things happen VERY fast. It feels like the throttle travels about three feet (it's maybe 8 inches), and once it's about half throttle, it feels like more than enough, more power than anyone would ever want. A quick glance at the manifold pressure might show a mere 35 inches, or maybe 40. That "10 more inches" is a LOT of additional power, and the fleeting thought for many will be, "Gee, do I really want to do this?" Then, "Ooops, too late, we're already 100 feet in the air, and accelerating, and we don't even have full power on it, yet!" So much for that CAF regulation. The noise is just incredible, even inside a padded helmet, with insulated earcups. I knew enough to expect this effect, and did manage to get full power before liftoff, but not by much. What I did not know is that the throttle friction lock must be really screwed down tight for takeoff. I had tightened it, but not enough. I quickly discovered that if it isn't really tight, the throttle comes back quite strongly on its own. I discovered this little item when I let go of the throttle to reach for the gear handle, and the engine seemed to quit, with the nose steeply up. I grabbed the throttle again, and pushed it back up. But I had to hold it there to keep the power on, I had to hold the stick with my right hand, and I really needed two or three more hands, because the airplane needed trim, I needed to get the gear up, and I didn't have any more hands! I tried reaching the friction lock with my thumb, but my thumb isn't that long. So there I sat, feeling not unlike a fool, keeping the engine running with my left hand, the airplane flying with my right, gear still down, pulling the nose up even more to keep the speed below 140 knots (barely). Steve, watching from the ground, seeing only that the gear was still out, started yelling at me on the radio, "Get your gear up, get your gear up, you forgot your gear!" The push to talk switch is on the stick grip, so even with both hands occupied, I was able to snarl back at him. I forget what I said, but it probably wasn't very nice. Rolls are really easy, like most high-speed airplanes, just lay the stick over and the roll is done before the nose can drop very far. That nicely keeps me from doing my usual sloppy "scoop" recovery. Loops are fine, but it's easy to get in to a high-speed stall at the top (snap-rolling), or coming down the backside of the loop (high-speed buffet). With the nose down on the vertical, speed builds at a terrifying rate, so you won't see me doing any loops at lower altitudes, I'll leave that to Mike. A LOT of pilots have misjudged that maneuver, and died because of it. It's best to make sure the airspeed is at or below 100 knots on the top of the loop, and pull as much g as the airplane allows coming down the vertical, helping to hold the speed down. A little variation in technique will mean a difference of several thousand feet for the return to level upright flight. Landings, and the approach to the landing, are FUN. The military "overhead" approach is used almost universally in these highly-loaded, high-performance aircraft, for several reasons. Mostly, it protects against an engine failure at a bad point, and it gives a very predictable pattern. It's also the fastest, simplest way to get a formation flight on the ground. The "Initial" is flown at 200 knots or more, level at 1,000 feet, aligned with the runway, from several miles out. Over the touchdown zone, the aircraft is rolled sharply to a fairly steep bank (80 degrees, perhaps), and as quickly as possible, the power is reduced and the flap lever is moved full down. By "loading" the airplane, we increase the drag a lot, and this, with the reduced power, should put us abeam the touchdown zone at 140 knots or less, just in time to put the gear down. The wings are level for only a second or three, long enough to get the gear down, then a tight, steep, descending turn is made to the runway. The airplane has a wonderful "feel," an approach without an airspeed indicator would be easy. My approaches generally work out around 120 knots until turning final, then a nice steady speed reduction to about 90 over the threshold, touching down in a full-stall, three-point landing, with a speed probably around 80 (I've never looked). Directional control is great, especially after flying something like the C-46! I'm always a little startled at the sound that tiny tailwheel makes, it really rattles for the slightest imperfection in the runway. If timed just right, the tailwheel can be put down just before the mains touch. When I taxied in after that first one, someone asked me how I liked it. I shrugged and replied, "Oh, just another airplane." The twinkle in my eye, and the goofy grin on my face must have given me away, because he took one look and replied, "Yeah, RIGHT!" So many airplanes, so little time. John Deakin is a 35,000-hour pilot who worked his way up the aviation food chain via charter, corporate, and cargo flying; spent five years in Southeast Asia with Air America; and joined Japan Airlines 33 years ago, where he was a Boeing 747 captain (until forced to move to the right seat recently upon reaching age 60). He also flies his own V35 Bonanza (N1BE) and is very active in the warbird and vintage aircraft scene, flying the C-46, M-404, DC-3, F8F Bearcat, Constellation, and others. He is also a National Designated Pilot Examiner (NDPER), able to give type ratings and check rides on 43 different aircraft types.